She has a soft spot for Duffy the Disney Bear and her favorite food is chocolate. She does her homework before dinner but really loves skateboarding, playing video games and bouncing on her trampoline. If Mahiro Takano sounds like any 9-year-old, think again. The third grader from Niigata, a rice-growing region in Japan, stars in Sia's latest music video "Alive," the just-released single from the singer's upcoming album. In a backdrop of stark gray, the girl, wearing a white and black wig evocative of Sia's hairstyle, performs a dazzling routine with quick fists and kicks, as well as displaying an adorably determined concentration of energy. Mahiro is a three-time Japan karate champion in her age group. She found making a music video was quite fun, and agreed she would do it again, especially if Justin Bieber or Taylor Swift offers. The video shoot with Sia in a Tokyo suburb took about a week. She made a point to move to match the music and "look cool," Mahiro said in an interview at her home, as she gulped down her dinner of curry and boiled eggs before heading to karate practice. "She was nice," she said calmly of Sia. "She kept saying I was fantastic." "Amazing" was the way her thoroughly impressed mother, Masayo Takano, remembers Sia repeatedly praising her daughter. "I was so excited," her mother said, letting out a squeal not quite as fierce as the long throaty screams her daughter makes during her karate routines. Mahiro's name means "ten thousand kindness, as well as ten thousand talents." She has a quick sweet smile when she isn't screaming. Her kicks, turns and punches in the air are part of "kata" forms that are like choreography in the Japanese defensive martial art of karate. Kata competition is separate from combat matches, which are also part of the sport. When doing kata, you slip into a focused character, Mahiro says. You imagine "a far more powerful enemy." She lost a contest just once, when she was in kindergarten. She wept, she recalls, so painful was it to lose. The trick is to practice as though you are in competition. And compete as though you are in practice, she said. She practices with a ferocious frenzy. She works out every day after school with her older brother. She was 4 when she started karate, inspired by her brother, then 5, who began lessons with their father. He is a truck driver. The moves must be powerful, precise and sharp, and getting better never ends, you can keep working at one detail after another, she added, sounding almost like a guru. When asked about the appeal of karate, her reply is rather simple - being able to make friends. "You get to play with them," such as tag, she said. Her parents say they are grateful to karate because it teaches a child discipline, hard work, the resilience to perform under pressure and manners. Bowing and cheerful replies, as well as constant practice and respect to hierarchy, exemplified in the belt system signifying skill levels, are integral to karate. Her teacher Takako Kikuchi acknowledged that some purists may disapprove of a young woman's participation in a music video. "But this little girl did not compromise in the music video. She is doing her best, delivering, correctly and thoroughly, one by one, the moves that she knows, with utmost concentration. There is nothing false about it, nothing made up. 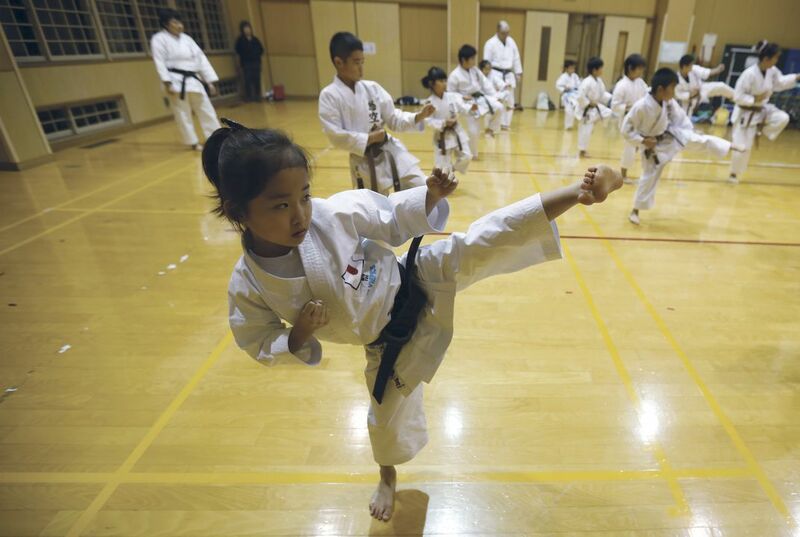 She is truly telling the world the way of karate," Kikuchi said proudly. 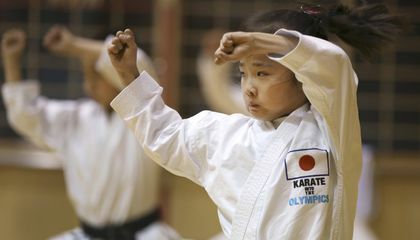 Mahiro has already been chosen an official "ambassador" for karate for the 2020 Tokyo Olympics. The sport is vying to be chosen for the games. Never mind that, even if that happens, Mahiro may not be old enough to compete. The age cutoff is still undecided. "I want to go to the Olympics," she says, "and win a gold medal." How is Mahiro’s karate related to performing in a music video? Its pretty cool that they basically named a girl not a boy like you would think karate kid because of her ability to do it and she is determined to do this it's not something that she doesn't like she loves to do it. I wouldn't do karate because I would be to scared but she isn't and that is good because she is being different and it is good to be different. I think it is amazing to see a kid who like karate because of her friends. If she keep getting first place like 100 times she would be famous. I wish I could be a champion on karate. I hope that I could reach my goals by winning and be the champion. I hope Mahiro could be okay. Karate, just like music, is an art form. In a music video, the singer has to have something on the screen that will get the viewers interest while still making sense. The graceful yet powerful moves of karate relate to Sia's amazing voice, as well as her songs lyrics. The art of karate can tie into the beat of the song, and the kicks and chops could follow the rhythm. Because of this, karate is related to a performance in a music video. I thought this article was interesting, as, not only is it a girl being named the "karate kid", but it is also empowering to know that a small girl can be a national champion. She said that she only lost a competition once, which really shows, "hard work beats talent when talent doesn't work hard." This little girl is amazing. Overall, I really enjoyed reading this empowering article. It is related to her performing because she is in the video imagining that she is in competition. She uses her karate skills in the video such as throwing fists out. because they kinda have the same moves like dancing. It also helps her karate get better. She is moving and doing all kinds of things that you could put in dances if you like that kind of music and dancing. She loves doing karate she is stuck to it so she wants to show people that she tries hard and to show she is right for the video. Because you both have to have talent to do both. And in her music video she did karate.